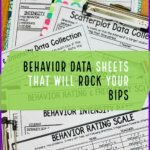 The hidden curriculum is a slippery thing because so many parts of it are dependent on the context and situation in which the behavior happens . 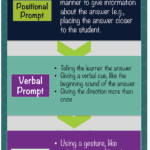 Not only does it involve understanding and looking for nonverbal cues, but once you recognize the cues, you have to consider the context. Clearly this means that the learning changes constantly and rules have to be flexible. When thinking about which items of the hidden curriculum to teach, we have to take certain factors that affect it into account. 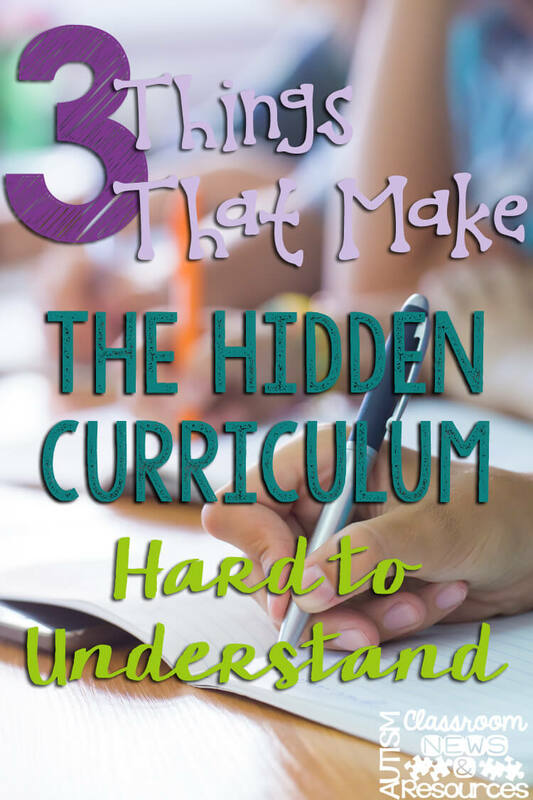 3 factors that affect the impact of the hidden curriculum. Age is clearly related to how “hidden” the curriculum is and how important it is for the individual to know. 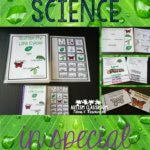 For instance, you may have seen the following as one of the hidden curriculum items I’ve shared on Facebook and Instagram. Many of you who teach younger grades realize this is pretty typical for young kids in kindergarten, first grade, etc. It’s not something you would see in junior high or high school. Typical kids get this as they get older and so the behavior stands out from the norm more as the student gets older. And, I would say, the patience of the speaker (teacher) probably decreases as the student gets older because it’s more unusual. Kindergarten teachers deal with this all. the. time! High school teachers probably don’t know how to react. Gender is another key element. Things that are OK for boys, not so great for girls. We all know there are gender differences in our behavior. Just check out this video…women of course will admit they are in pain…men….not so much. 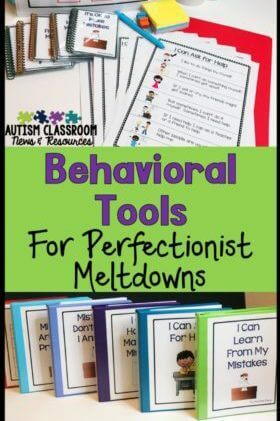 While some of this is stereotypical, some of it has to do with how well other kids (and sometimes adults) accept you based on gender-specific behavior. It’s fine to buck these trends, but it’s best if it’s a conscious decision. Otherwise it becomes something that might make kids vulnerable. The best example of gender-specific hidden curricula is the bathroom situations I talked about in this previous post. Men and women have different codes of behavior in public restrooms. Knowing them can be the difference between safety and vulnerability in the public context. Finally, the culture of the situation affects the hidden curriculum. The culture can be the culture of the country or region in which you live. Certainly if I lived in Japan, I would make lots of what we would be consider to be cultural mistakes because I’m unfamiliar with their culture from greetings to ways of speaking in groups. But culture can be more intricate than the country you live in. It can be related to race, setting, as well as situation. For instance, organizations, including schools, have a culture. I’ve worked in schools that have very elite cultures where the expectations of the families and the faculty are incredibly high for academic achievement above all else. What gets you in to the best schools are the most important elements, so following the rules and getting good grades are premium. Being a “nerd” is highly accepted in these schools. Expressing individuality through dress and expressing opinions are often not encouraged. I’ve worked in other schools where the focus is on teaching students to express themselves and acceptance and encouragement of students to be individuals is highly prized by the community and the faculty. In those situations, being highly creative and expressive is highly accepted. In those schools, not speaking up with your opinion is considered unusual behavior and makes a student stand out. Please note I’m not saying that standing out is a bad thing–it’s not. However, the question is whether you stand out because you make a conscious decision to be different (e.g., by selecting a different manner of dress than those around you to assert your individuality) or not (e.g., dressing differently without realizing it and having others tease you or even just look at you funny about it). The first I choose; the second happens to me. We want our students to make their own decisions about how to fit in and who they are…knowing the parameters needs to factor into that decision. So, you have to consider the culture of the organization when determining the important hidden curriculum items to teach. It also really highlights the need to teach beyond just rote knowledge of hidden curriculum items. It’s a great start, but students will encounter different cultures and situations at different ages that are going to require them to figure out the unwritten rules on their own. And that’s where I will pick up next time…with ways to teach the hidden curriculum and things we should think about addressing in our classrooms to prepare our students to be successful in the long term. 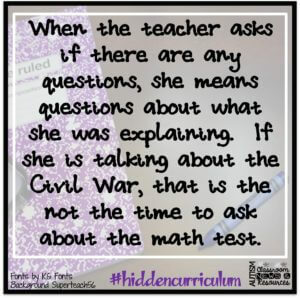 In the meantime, keep an eye out of the daily #hiddencurriculum items on Facebook and Instagram. 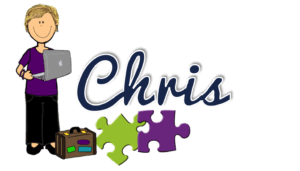 Are there hidden curriculum items that you feel are important? Please make sure to share them!